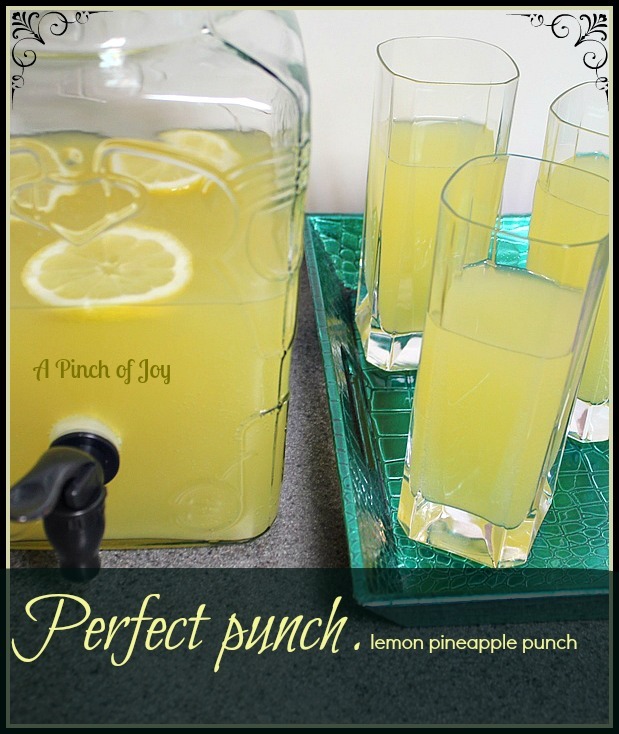 Otherwise known as Perfect Punch or Lemon Pineapple Punch, Snappy Punch is the name Wheels gave this refreshing drink,. As in “Got any of that snappy punch left?” There is never any left because everyone loves this golden nectar and it disappears in a flash where ever it is served. I’ve made it for baby showers, teas, wedding and anniversary receptions, girl’s night out and a “ladies who lunch” picnic. It fits all sorts of themes with its golden color and by repeating the recipe goes from intimate gatherings to big celebrations. It’s also perfect to make just because you want to have a drink of snappy punch. I spied a can of pineapple juice in the pantry the other day. Made me remember how Wheels always missed out on the snappy punch so I made some just for him. We had a good laugh and some good punch for a couple of days. It’s the perfect punch for any event. The flavors blend beautifully. You can’t taste the lemon or the pineapple because they make their own subtle flavor “snapped” up with the lemon lime soda. I used a packet of Country Time lemonade mix and Sprite. The lemon lime soda – any brand, diet or regular – gives it that little extra kick. You can add your own version of kick if you want when you make it. Serve cold. I’ve never added ice because the punch is gone before it reaches room temperature! Sixteen 8 ounce servings or thirty-two 4 ounce (punch cup) servings. A light refreshing punch with a little "snap"! Serves: Sixteen 8 ounce servings or thirty-two 4 ounce (punch cup) servings. Before serving, garnish with lemon slices if desired. Subscribe by email on the sidebar or follow on Facebook, RSS feed, bloglovin’ or twitter using the links here or the blue buttons on the header! Follow my pinterest boards here. If you found this helpful, please share on your favorite network by clicking one of the buttons on the bottom of this post. This looks refreshing and I am not a fan of pineapple. Thanks for sharing on Foodie Friends Friday. Looks delicious! Easy recipes are my favorite! Tammy @ A Walk in the Countryside recently posted…Deep Fried Okra as an Appetizer? That sounds good..and easy too! Great for a summer party!